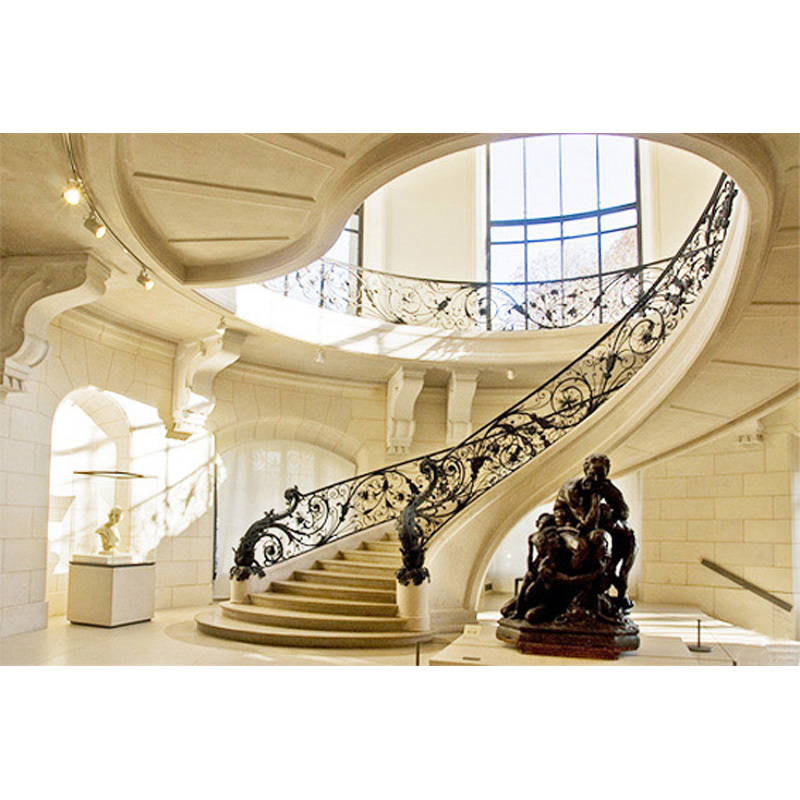 Beautiful ironwork balcony designed by Charles Girault for the Petit Palais in Paris, France. At ArtFactory.com we use these photos of historic masterpiece furnishings as inspiration for our modern designs, hand crafted using the same materials and techniques as the originals. Our custom furnishings are hand made in America in any style and design. Historic Wrought and Wood Stair Rails: Original Craft (Not Reproduction) by Master Blacksmiths using solid, hand forged, wrought iron – no castings or hollow faux metals. All custom ironwork includes heat applied iron oxide, hand patina finished – no powder coating or faux paint on iron finishes. What is Wrought Iron? All custom iron stair railings are American made and Guaranteed Forever, backed by over a century of fine art craftsmanship, since 1913. Order any size, style or design. Designs By H. J. Nick and ArtFactory.com, a handmade in America Handmade manufacturer based in Scottsdale, Arizona, has been designing and building some of the world’s finest furnishings for top interior designers with ordinary clients as well as more prominent and successful Individuals, CEOs, Leaders, Royalty and Celebrities for over 100 years. Most of our clients want custom handmade products that have a BIG WOW factor and elegance, and they all want investment value and products that makes a proper statement reflecting their personality and environment. The Petit Palais (Small Palace) is a museum in Paris, France. Built for the Universal Exhibition in 1900 to Charles Girault’s designs, it now houses the City of Paris Museum of Fine Arts (musée des beaux-arts de la ville de Paris). Arranged around an octi-circular courtyard and garden, the palace is similar to the nearby Grand Palais. Its ionic columns, grand porch and dome echo those of the Invalides across the river. The tympanum depicting the city of Paris surrounded by muses is the work of sculptor Jean Antoine Injalbert. The exhibits are divided into sections: the Dutuit Collection of medieval and Renaissance paintings, drawings and objets d’art; the Tuck Collection of 18th century furniture and the City of Paris collection of paintings. The museum displays paintings by painters such as Rembrandt, Rubens, Nicolas Poussin, Claude Gellée, Fragonard, Hubert Robert, Greuze and a remarkable collection of 19th-century painting and sculpture: Ingres, Géricault, Delacroix, Courbet, Monet, Sisley, Pissarro, Cézanne, Modigliani, Carpeaux, Maillol, Rodin etc. There is also a relatively small but important collection of ancient Greek and Roman art. Every creative enterprise is always built on a foundation that was laid down by its predecessors. Creative people are also dependent on the groundwork laid down by those who came before them. H. J. Nick, artist and direct descendant of the Marbella brothers, and ArtFactory.com have built on these foundations and have raised the bar of quality even higher. Thus setting a new standard and offering the finest one of a kind handmade furnishings found anywhere in the world in the 21st century. Our master craftsman build all designs using the identical methods and materials of the historical period of each antique or new original design concept. We hand make all of our custom furnishings in the same hand and materials as it has been tried and tested for hundreds of years – to stand the test of time. Call the ArtFactory.com to discuss your custom furnishing project at 1-800-292-0008.